with her own hat too, and you can pick that pattern up right here. This pattern has been translated to Dutch. Many thanks to Jeannette Kemp for this generous gift! Scroll down this page for the pattern. Look for the green print friendly button at the bottom of this post and there you will also find the option to leave a donation. Thank you so very much and enjoy! I did not measure out how much yarn I used. Please see question #3 here for the amount that's in the rolls of yarn I buy, for the bunny you need less than 1 package of Red Heart Super Saver. Same goes for all the accessories. 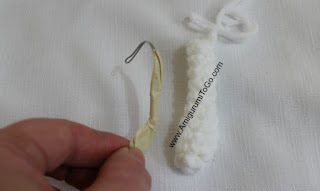 4mm hook *I used a 5mm but I crochet fairly tight so a smaller hook (4mm) will be a better choice for you depending on tension. *There is an assembly section at the bottom of this page. Please note I use pins to pose all my amigurumi. They will not stand on their own. sl st next st and f/o leaving a bit of a tail. Weave in and out of the remaining stitches then stuff more. Use a stuffing stick or you finger to push the stuffing all around the nose area and anywhere else you need it. Once you are satisfied there is the right amount of stuffing and the head shape looks good, pull the yarn tail tightly and knot off. Carry the yarn tail inside the head to hide it. Using yarn or embroidery thread, whip stitch a nose just above where you finished off. See photos in assembly section below. f/o leaving a long tail for sewing. Stuff the body. Weave in and out all the stitches of the last row and pull to close up the body but leave a bit open as pictured, knot off. 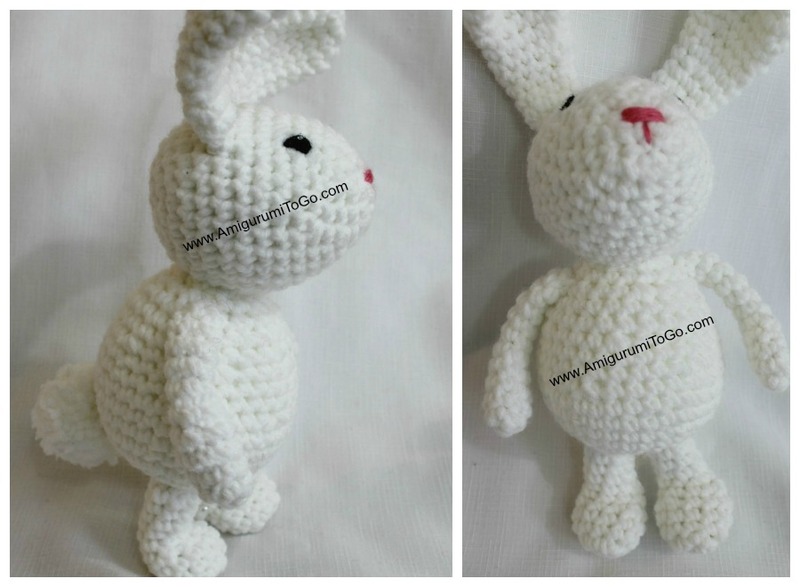 You will use the remaining yarn tail to sew the head and body together. sl st next st then f/o leaving a tail for sewing. Do not stuff the ears. You can push a pipe cleaner inside if desired, this will help pose the ears but it's not necessary. sl st next st and f/o leaving a long tail for sewing. Add in folded pipe cleaner or wire to make the arms poseable. If you use wire as I have, make sure to use masking tape on the end that will be in the hand part so it's not at risk of poking through. Wrap the masking tape enough times to make it a bit bulky. You can add in a thumb just by wrapping yarn in the same spot a few times. Or add in a couple hdc's. Knot off when done and hide the yarn tails inside the arm. sl st next st and f/o. Bend a pipe cleaner and push the bend to the end , using a stuffing stick, stuff the foot up to row 5, bend the leg at row 6 then stuff the rest of the leg. In the hat and scarf pattern I show how to make a pom pom and there's also a video link if needed. 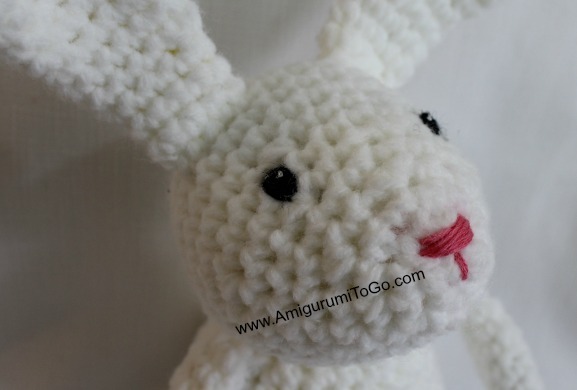 For the pom pom tail on this Winter Bunny I wrapped the yarn around 3 fingers and wrapped about 50 times. Look for the pom pom tutorial here. 1) sew the head to the body. Take your time to position it just right. Make sure you sew all the way around and there's no gaps when you're done. 2) Sew the arms and legs on. The arms are whip stitched to or about the 16th row. See the photo below for placement of the legs. 3) sew the tail to the back of the body. 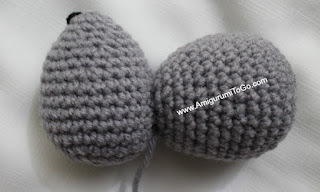 4) sew the ears on and about the 6th row. Pin them in place first, this will help hold them while you sew and also helps you determine they are even and look good before sewing. 5) with black yarn put in the eyes. Put them where you think looks best. The ones pictured are wrapped around the 12th row with 5 visible stitch holes between them. I went in through the side of the head, came out where the first eye would go, put in a couple wraps then back into the head, go down a bit so you don't see the black through the white yarn, and come out where the next eye will go. Put in a couple wraps and then bring the yarn back out where the other yarn tail is hanging. Knot them off then hide the knot inside the head. After this step was done I went over the black yarn with black paint just to make those parts look more solid then added a dot of white paint. It's up to you if you want to do the same. If you have any troubles putting the eyes in, watch this clip where I show how to do this on another doll. 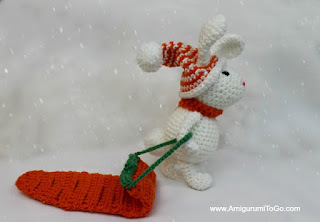 Fabulous bunny and sled. Thanks so much for sharing. 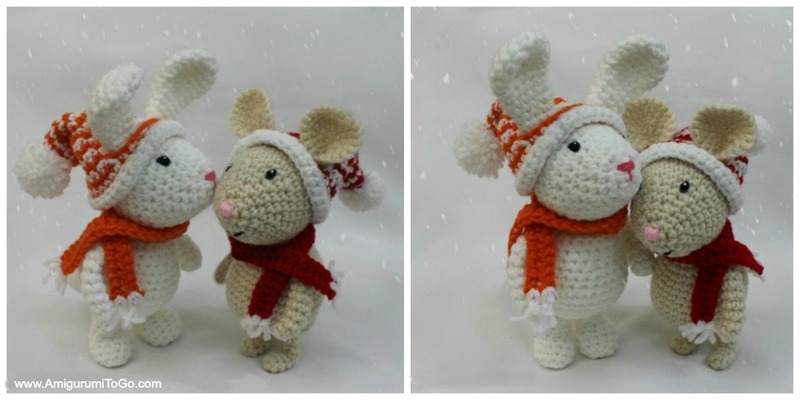 Sandra, thank you for sharing your amigurumi patterns!!! So adorable. Thank you so much!!! This pattern is so cute and works up really quickly too - thank you for sharing this, making them is quite addictive! Muchas gracias por el patrón. Es precioso!! how big is this guy? its super cute! Hi I just love your patterns. Is there a download button to download the pattern.